Summary: In Creation’s early days, Adam and Eve listened to the Tempter, followed their own desires, and cast off the image of God. They brought divine judgment and death upon themselves and all generations to follow. When the Lord gave them opportunity to fess up, they instead passed the buck: the man blamed His wife and His God while she blamed the serpent. God blamed them all and judged each. His harshest condemnation fell on the serpent — Satan embodied — as He promised that the woman’s Seed would one day crush the Devil’s head. Jesus came in human flesh to undo the Devil’s damage, bringing life to those dead in their trespasses and beginning the New Creation that will supplant the Old at the end of time. He accepted the blame — not for His sins but ours — and paid the price by suffering and dying on the cross. He resisted Satan’s temptations, crushed the serpent’s head, and accepted our deaths as His own. Christ clothes us in His own righteousness, restores the image of God, grants forgiveness instead of condemnation, and promises to raise all who believe in Him to everlasting life. Knew strife and toil and pain. He came our lives to gain. All of our grief and care. And by His wounds we’re healed. Tempter And set Creation free. To give dead sinners life. Text: Now the serpent was more crafty than any other beast of the field that the Lord God had made. Audio: Click to hear the MP3 of In the (New) Beginning: The Fall. 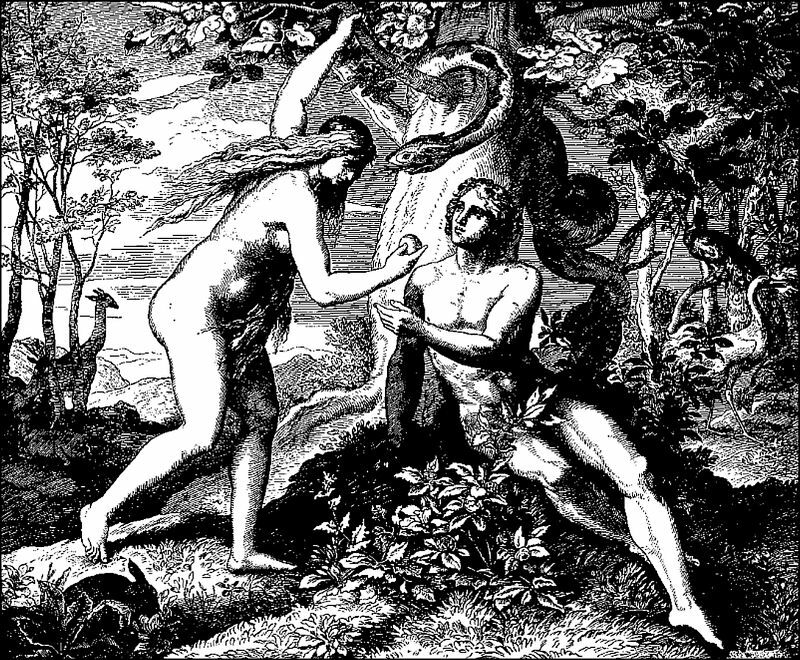 Illustration: The Temptation and Fall of Adam and Eve from Die Bibel in Bildern by Julius Schnorr von Carolsfeld at Wikimedia Commons.